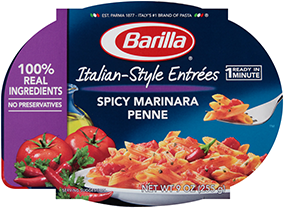 Try Barilla Italian-Style Entrées Meat Sauce Gemelli. This classic pasta and sauce combination is ready in 60 seconds, making it a great quick and flavorful meal! Meat Sauce Gemelli is made with non-GMO ingredients. For more information, please read our position. This delicious meat sauce is based on a traditional Italian recipe from Bologna and combines vine-ripened tomatoes, and real beef seasoned with onion, celery, carrot and spices. Combined with perfectly prepared Barilla® Gemelli pasta for a delicious meal to be enjoyed anywhere.